This is a collection of the best fitness and gym WordPress themes designed for health and fitness clubs, gyms, personal trainers, sports clubs, fitness professionals, CrossFit programs, boot camps, and other health and fitness business websites. Most the premium themes below have been specifically designed with the health and fitness industry in mind with custom homepage designs, custom page layouts, and color schemes. 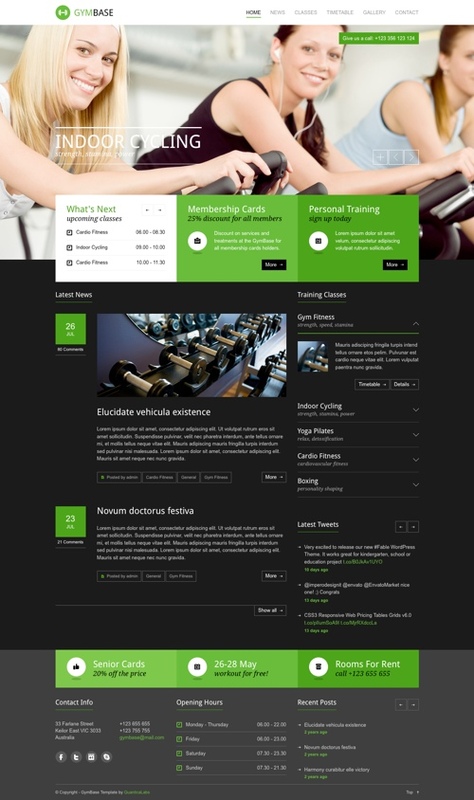 They also include the features and functionality required in a fitness and gym business website such as options to display schedules and timetables, classes and programs, list staff / trainers profiles, events and calendars, facility equipment and amenities, pricing and memberships plans, open hours, venue location / map and other information about your club or center. The majority of the gym and fitness themes below are also mobile friendly with responsive layouts so your website will look great on tablets, smart phones and all mobile devices. Meridian Fitness is a feminine fitness and gym WordPress themes ideal for gyms, fitness centres, yoga studios, pilates classes and other fitness related business catering to women. The premium theme from Meridian Themes has a feminine color scheme and a clean and professional design that been crafted with attention to detail. Some of the key features and benefits of the theme include: custom pages for classes, schedules and trainers, multiple layout options, customization options for colors, fonts etc, one click demo import, blog section and more. JustFit is an exercise and fitness WordPress theme from MyThemeShop built for fitness and health professionals. The premium theme has a sleek and engaging design ideal for gyms, health centres, fitness community websites, personal trainers, health and supplement product stores and other businesses. It also has a magazine style layout option ideal for health and fitness blogs or magazines. Some of the key features of the theme include: a customizable homepage with drag and drop sections, slider, unlimited color options and backgrounds, custom sections for products, exercise types and testimonials, WooCommerce support for a shop section or complete website, video posts section, off-canvas mobile menu, SEO and Adsense optimized, powerful options panel, advanced typography options, WP mega menu compatible, WP Review Pro compatibility, full screen product showcase page, parallax scrolling, and more. 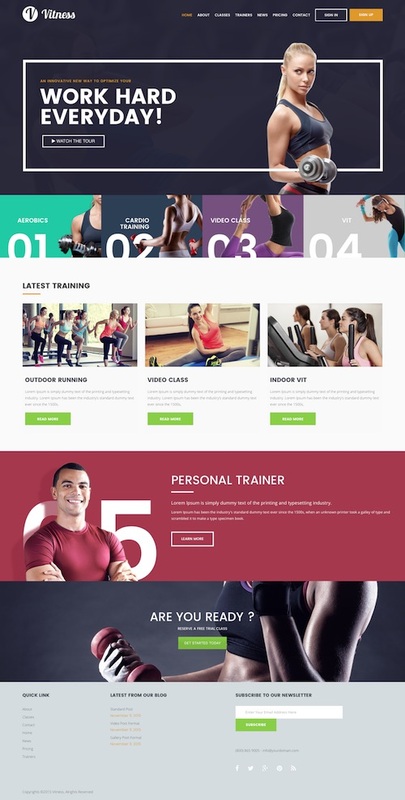 Vitness is a premium WordPress theme for gym and fitness websites, personal trainers, aerobic classes, sports clubs, spas, yoga centers, sports training centers and related sport and fitness websites. The premium theme from Sketch Themes has a bold and modern design and all the features you need in a fitness or gym website. You can display your classes and schedules, trainers, pricing, news, and all the other relevant information about your business or services. Some of the technical features of the theme include: a fully responsive design, premium slider, HTML5 and CSS3 support, translation ready, sticky header navigation, custom pagination, theme options and more. The Gym & Fitness WordPress theme from WPLook Studio is a stylish and professional theme designed for gym and fitness clubs, personal trainers, health clubs, yoga classes, sporting venues, and related businesses. 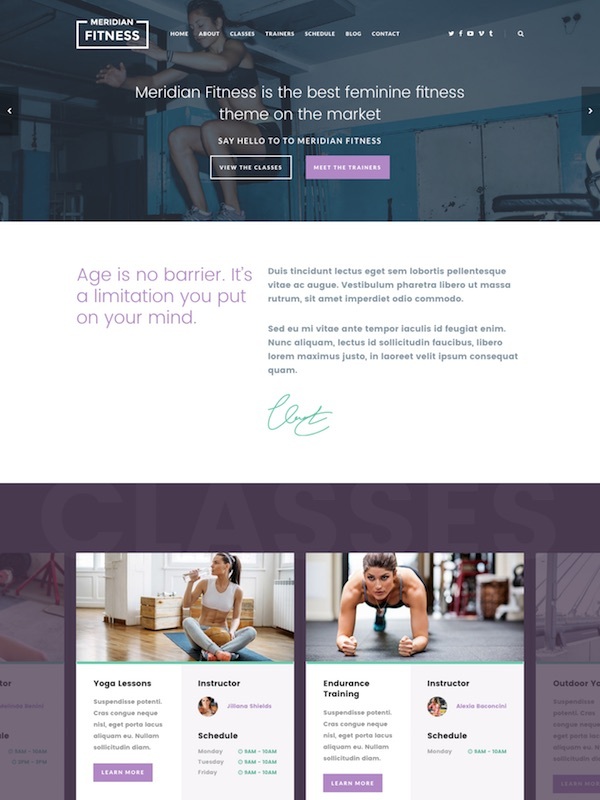 The theme has a custom homepage with large featured slider and sections to display all the important information about your establishment such as daily classes, trainers, membership options, blog and more. Some of the other key features include: a mobile friendly responsive design, unlimited colour scheme options, WooCommerce support, advanced theme options, multilingual ready, custom widgets and more. The Fitness Sport Gym WordPress theme has been built for gyms, health clubs, fitness centers, personal trainers, sport clubs and other health and sport related websites. The premium theme has a purpose built design that is slick and modern. The homepage has a featured slider and section to display important information about your gym or club. It allows you to display events and classes, schedules and timetables, opening hours, team members, news and more. One the technical side the theme offers unlimited layout options with a drag and drop builder, a mobile friendly responsive design, WooCommerce support for a shop or to accept payments, 10 different header styles, unlimited dynamic sidebars, parallax effects, full screen background images, custom fonts, valid HTML5 and CSS3, translation options and more. InShape is a heath and fitness WordPress theme for personal trainers with a mobile friendly responsive design. The premium theme from Theme Fuse has been specifically designed for personal trainers, fitness junkies, gyms, health clubs and other health and fitness industry websites. It has a modern and professional design and includes some custom fitness specific functionality and tools. InShape has a built-in Workouts module that lets you easily add your programs by workout days, muscles worked, intensity, level, and more. Every exercise and training session has nice graphics showing the body parts worked and the workout goals. You can also add videos and images for every exercise. It also integrates the workouts with a very powerful calendar that will make it easy to understand and follow for trainees. The theme is also highly customizable and you can easily change colors, fonts, layouts, backgrounds and more without needing to get into the code. Some of the other key features in the theme include: a bunch of built in page layouts (workouts, stories, services, pricing etc. ), two navigation menu options, a highly customizable mega menu, HTML5 animated slider, shortcodes, multiple sidebars, language translation options, a retina ready and mobile responsive layout and more. The Hercules WordPress theme is specifically designed for gym, sport and training websites. The premium theme has a clean and lightweight design and is mobile friendly with a responsive layout. It comes with 2 versions – a one page design or a multi-page traditional website design. Some of the other key features of the theme include: custom post types and sections for classes, trainers, timetable, testimonials, map, blog and other information, infinite colour options, 600+ icons, shortcodes, HTML5 and CSS3, and Bootstrap 1170px grid. Sportify is a sports oriented WordPress theme designed for gym, fitness center, sport club, personal trainers and other sport and fitness related websites. The premium theme from Tesla Themes has a flexible and modern multi-purpose design that is mobile friendly with a fully responsive layout. It includes a lot of other great features including: beautiful sliders and transition effects, filterable timetables, trainer’s section, classes / lesson section, events section, contact info and map, WooCommerce ecommerce support, 13 custom post and 9 page templates, Google fonts, and social media support. The theme is powered by the Tesla Framework which is a powerful framework and administration tool that allows you to easily customize the look and functionality of your theme without advanced coding knowledge. The Fitness WordPress theme has a minimalist design with a mobile responsive layout. The premium theme is designed for fitness, gyms, and sports clubs and has a suitable design and set of features for those types of websites. Some of the key features of the theme include: trainers and classes with details page, a responsive timetable page, classes with an accordion page, contact page with map and location, multiple colour options, WooCommerce integration for an online store, typography options, filterable gallery, Font Awesome icons, Bootstrap, HTML5 and CSS3 code. 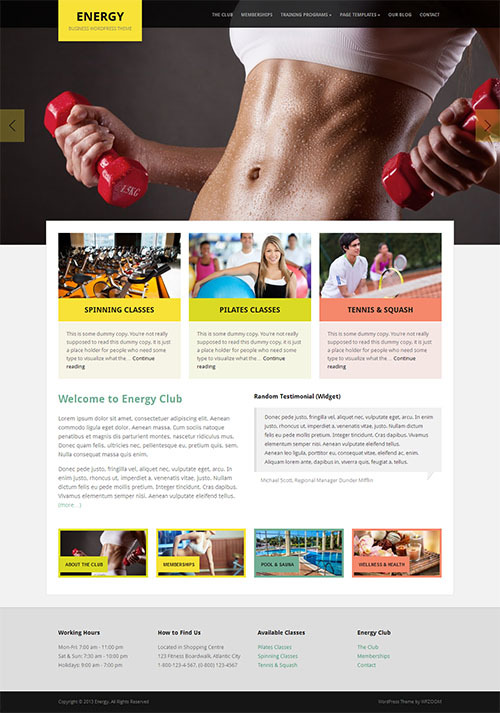 Energy is a corporate WordPress theme with a mobile responsive layout and a modern and professional design that would work well for health clubs, gyms, sporting venues, or any other business wanting to impress with an enticing website design. The Energy theme has a dynamic homepage builder so you can build and customize your homepage structure via custom widgets. It has 2 different header styles you can choose from and an easily configurable full width slider on the homepage lets you showcase your main products or services. Some of the other interesting features of the theme include: a mobile friendly responsive design, theme options panel with easy colour and font controls and other options to easily customise the site to your needs, a testimonials archive, a blog section, various post and page layout options, custom background and logo input, HTML5 and CSS3 coding, custom shortcodes to easily add columns, buttons, lists etc and much more. 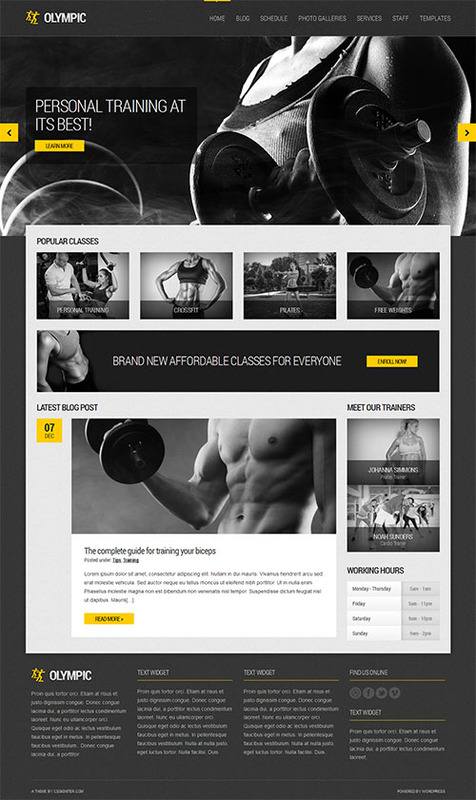 Fitness Gym is a premium WordPress theme aimed at fitness, gym and other health and sport related websites. The theme has a modern and stylish design that is retina ready and fully responsive so it works on mobile devices. Its built with HTML5 and CSS3 and is loaded with features and customization options. Some of the notable features of the theme include: a visual page builder, 4 header layout styles, timetable schedule, custom background options for each page post, 6 different portfolio grid columns, right or left sidebars, colour change options and more. Gym Extreme is a dark coloured WordPress theme that has been built for fitness and gym websites. It has a responsive design and some of the key features include: classes schedule management, facilities management, photo gallery, slider, theme options, page builder, custom widgets and Google fonts. Young Fitness is a mobile friendly WordPress theme with a modern and unique design suitable for health and fitness centres, gyms, sport clubs and other establishments. The homepage has a featured slider and sections to display information about your club, classes, trainers, news and other info. Some of the other key features of the theme include: a responsive design, nextgen gallery, 2 homepage options, page builder, mega menu, 6 colour styles, shortcodes, Google fonts, theme options, animated elements, and more. FitPro is a WordPress theme designed for fitness, gym and sport related websites. Apparently the developer conducted a detailed study on the requirements and needs of actual fitness related business and the FitPro theme has been designed specifically to meet the needs of gym websites, fitness / sport clubs, online fitness and health clubs and other related small businesses. The theme comes with a heap of features and options and aims to incorporate the latest trends in web design. Some of the key features include: advanced events management via the events calendar plugin, WooCommerce integration, trainer profiles, group classes, testimonials, pricing plans, gallery, facilities, single or multi-page design, visual page builder, 1500+ retina icons, powerful admin panel and easy customization options, page header settings, boxed or wide layouts, Google fonts, and more. Gimnasio is a responsive WordPress theme designed with fitness, gym, sport, events and other related websites. The homepage has a slider and sections to display your facilities, events, gallery, news, trainers, contact information and other details. It has typography options, theme options panel, a mobile friendly and retina ready layout, customization options, shortcodes, translation and multi-lingual ready. The Fitness theme is a responsive WordPress theme for fitness and gym websites. The theme has a modern and functional design that is mobile friendly. Some of the key features of the theme include: class schedule and timetable, filterable trainers page, custom widgets, carousel slider, HTML5 and CSS coding, unlimited colour styles, and more. GYM is a professional looking gym and fitness WordPress theme. It has a minimalist design and is mobile friendly with a responsive layout so it works and look good on all mobile phones and tablets. Some of the key industry specific features include a responsive timetable page, classes page with an accordion design, map and location section, trainers page and more. The theme has a long list of other features including: a front-end drag and drop page builder, WooCommerce support, 8 skins and custom colour options, theme options with advanced customization options, mega menu, advanced page post meta options, wide or boxed layouts, unlimited sidebars, custom widgets, custom background options and much more. Specifically designed for gym and fitness websites the Gym Guide WordPress theme has a traditional look and feel. It’s designed to be easy to set-up and get running straight out of the box but is also easy to modify. Some of the key features include: classes schedule management, facilities management, events management, drag and drop page builder and theme options, galleries, slider, 8 pre-made colour schemes, WPML and translation ready, WooCommerce support and more. Fitness Life is a purpose built WordPress theme for fitness centres, health clubs, gyms, yoga classes and other sport and health related websites. It has a colourful but rather heavy looking design. The theme has a mobile first responsive design so it’s optimized for tablets and mobiles. It has some specific features and functionality such as dedicated pages for classes, trainers, membership, timetables and schedules, news list, contact form and more. Dharma is a multipurpose premium child theme for the Genesis Framework. It has a modern and flexible design ideal for a wide range of uses including: agency and small business websites, gyms and fitness centres, personal trainers, consultants and others. The theme is built with Bootstrap and includes a lot of cool features. Some of the key features include: 3 different page header styles (image slider, static image or HTML5 video) which can be set on a per page basis, a portfolio section, services section, video and image sections, pricing tables, team section, testimonials and clients, shortcodes for buttons, boxes, tooltips, tabs, accordions and more. Being a Genesis child theme is also has all the other great features and benefits of the Genesis 2.0 Framework. If you have a gym and fitness center for women or are a female personal trainer this theme will work well for you. Crossfit is a responsive and stylish WordPress Theme that is perfectly designed for health, fitness, spa, gyms, yoga classes and it would work perfectly for many sport business types. Some of the key features include: weekly schedule page, instructor, locations and classes custom post types, unlimited colour options, sports shortcodes, 600 webfonts, custom logo and favicon upload, mega menu, mobile friendly design and more. The Sporty WordPress theme from 7Theme is a responsive and stylish theme designed for gym, sport club, fitness centres, personal trainers, spas, yoga classes and other sport businesses. The theme has a design that really suits the industry and is mobile friendly with a responsive layout. Some of the notable features include: custom post types for classes, locations and instructors, an AJAX powered schedule, sport related shortcodes, advanced typography options, customisable colours / fonts / backgrounds, mega menu, portfolio gallery and more. Workout is a premium WordPress theme designed specifically for the fitness and crossfit community. The theme has a clean, sleek and modern design ideal for fitness centers and gyms and comes with all the features they need. It lets you display your gym’s important information such as programs, class schedule calendar, workout of the day (WODs), coaches / trainers, open hours, map and contact information. Some of the other notable features include: WooCommerce shop support, eye catching and customizable page animations, different header and footer styles, unlimited colours and layouts, 100+ shortcodes, fitness related font icons, post formats for classes and programs, Google typography and more. Game Plan is a WordPress theme built for events, fitness, gyms, and sport club websites. The premium theme has a strong and bold dark design (light option available) with colourful accents that suits the industry. It’s mobile friendly with a responsive design that will look good on computer displays, tablets and mobile devices. Game Plan also has a lot of great features including: event calendar, drag and drop page builder, unlimited colours, RTL languages support, icon fonts, retina ready, WooCommerce ready, admin options panel, and more. If you have a gym, fitness center, sport club or a personal trainer the Sport and Fitness WordPress theme might be suitable for you. The premium theme has a custom design appropriate for the industry and has a number of unique features. It has a calendar to show gym events, ability to show the gym timetable in a timetable ticker, show staff / trainers in a custom trainer page, display activates nicely grouped together and a tariff table builder. Some of the other features include: a responsive layout, slider, unlimited colours, Google map, custom widgets, and more. The Get Fit WordPress theme is a multi-purpose template built on the Twitter Bootstrap framework and includes a lot of handy features. It has a fairly clean and light design with a responsive layout. Some of the key features include: theme options panel, unlimited colour styles, custom pages for trainers and classes, classes schedule calendar, and more. GymBook is a business WordPress theme marketed as a theme for fitness and gym websites. While the theme doesn’t really have any specific features as such for a gym or fitness center it has a generic design that would be suitable for one. Some of the key features include: a built-in event calendar, responsive layout, unique slider, page customizer, page customizer and options to change the colours, fonts and styling. Power Gym is a purpose made WordPress theme to create a gym, fitness, or any sport related website. Initially released in 2012 the design is probably showing its age a bit, but its still suitable for a simple gym or fitness website and is mobile friendly with a responsive design. It includes several gym specific features such as dedicated pages for programs, trainers, photo galleries, videos and sport categories that can easily be created using the custom post types. The Fit WordPress theme has been designed with fitness and gym websites in mind. Some of the main features include: custom post types and templates for trainers and classes, custom widgets, light and dark colour schemes, colour change options, and a mobile responsive layout. The Gym Base WordPress theme has a clean and minimalist design and is specifically built for gym fitness websites. It contains a custom homepage that lets you present important information about your center, a timetable page, classes pages, filterable portfolio gallery with details page, contact page with map of location, contact form, custom colour scheme options, lots of font options, theme options panel, and more. Fitness is a versatile WordPress theme with a flat design created for fitness clubs and gyms or any other business. It includes a courses creator for classes / events with a custom post type and options to add meta data such as set days, times, skills / difficulty bar etc. You can also easily add trainers / staff members with their photo and list important details. Some of the other features of the theme include: a responsive design, 3 different homepage styles, HTML5 and CSS3 code, page templates, gallery lightbox, theme options and more. Personal Trainer is a WordPress theme designed for male and female personal trainers. The premium theme has a one page design and allows you to showcase and offer services in the sport, fitness and health industry. You can display your portfolio, classes, pricing plans, training schedule, blog, contact details, and more. Some of the key features include: a slider, multiple display options, sticky header, various pre-built page layouts, Google webfonts, theme options and more. The Strong WordPress theme from 7Themes is perfect for health, fitness, spa, gyms, yoga classes and other businesses. It has an AJAX powered schedule timetable, post types for classes, instructors and locations, lots of shortcodes, unlimited colours, customizable styles, slider, options panel and more. Sport is a multipurpose WordPress theme suitable for a gym and fitness club website. It has a clean, modern and minimal design with a stack of features. It has a timetable scheduling system, team member template, WooCommerce support, retina and responsive design, visual composer page builder plugin, mega menu, wide full width header menu, options panel and a heap more features. Fitness Motivation is a complex and feature packed WordPress made for fitness, gym and sport websites. The responsive theme has a modern and professional design that will make your club really stand out. It has custom post types and templates for: classes, trainers, events, highlights, and a special timetable page. Custom widgets for things like pricing, open hours, classes schedule, events and other allow you to structure the layout the way you want. Some of the other key features include: unlimited colour options, lots of shortcodes, Google maps, unlimited layouts, newsletter settings, social network settings, theme options and more. The Gym & Fitness WordPress theme is a responsive theme that could be used for club websites, gyms, fitness, sports, teams, health care, personal trainers, and so much more. It has a weekly schedule of classes and events, ability to display team members, special sports icons, and a heap of other features and options. The themes above have been designed as turnkey solutions for creating a gym or health and fitness club website, quickly and easily. However there are plenty of other business / corporate WordPress themes and multipurpose WordPress themes available that would also be suitable when combined with the right plugins for the required functionality. You just need to look past the images uses in the demo sites, look at the core layout and features and have a bit of imagination. Anything is possible with WordPress!